Venue: Expocentre Fairgrounds, Pavilion 1, Conference area. - Fiberglass composites: manufacture and use. - Carbon fiber based composites. NEO Chemical LLC, Dzerzhinsk, Russia. Glass Fiber and Carbon Fiber Weaving Machines of VUTS, a.s.
Czech Cutting Machines, Nonwoven Stands and Impregnating Lines. Modern Composites Making Technologies and Hi-Tech Italian Equipment. KOIMPEX S.r.l., Moscow Representative Office. Polymer repair composites for year-round use in the construction and operation of transport facilities. 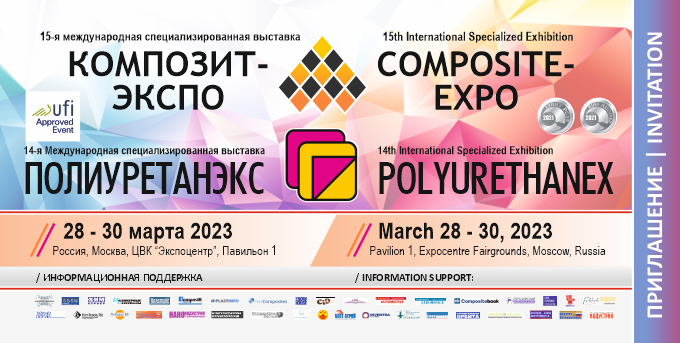 Polymer Innovation Centre of Dmitry Mendeleev University of Chemical Technology of Russia.